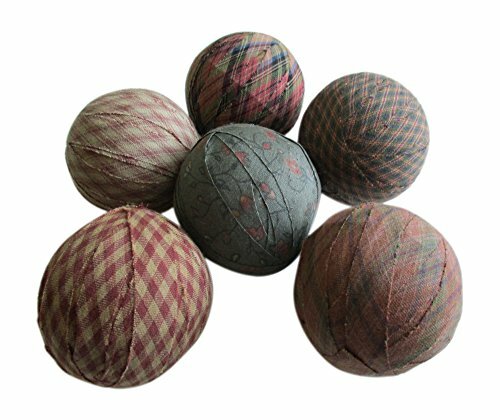 The primitive balls are done in a Primitive colors and patterns from the past century, in red russett, green, dark olive, blue and tan. Decorative Bowl Fillers. Perfect for everyday Rustic and Primitive decor or tuck some pip berries in bowls, plates, baskets, jars or any primitive container. Wire basket is for display only. Set of 6 rag balls in micro checks, plaids and delicate floral. Each Ball is approx. 2.5 Inches in diameter. 6 fabric covered balls in a Primitive russett red, green, dark olive and tan. This set is handcrafted. Therefore each piece has its own unique character. Any imperfections add to the primitive charm and aged appearance. Care: Spot Clean Only. No Chlorine Bleach. If you have any questions about this product by From The Attic Crafts, contact us by completing and submitting the form below. If you are looking for a specif part number, please include it with your message.